Our quest for authentic food currently has us in Southeast Asia. Most of the month of October was spent in the Philippines attending TBEX Asia 2016 a travel blogger conference. 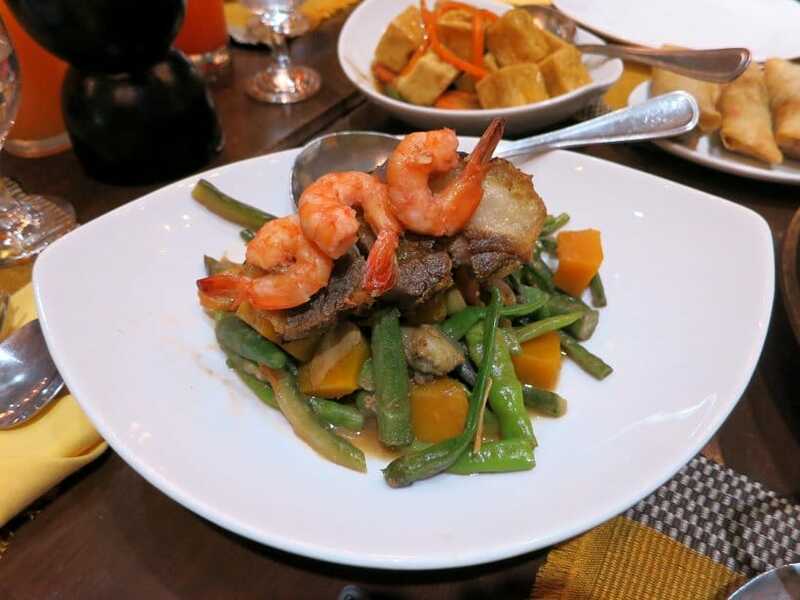 Additionally, we also spent our time exploring the food in the Philippines and the authentic and heritage dishes. We traveled around the country and visited Cebu City, world-famous for “lechon” (whole-roasted suckling pig). We took a gastronomic heritage tour to the culinary capital of Pampanga, located in the central Luzon region. Our travels also took us to the provinces of Illocos Norte and Illocos Sur in the very north of the country to explore the unique Ilocos food. And finally, we explored the culinary and gastronomy scene in Manila, the capital. 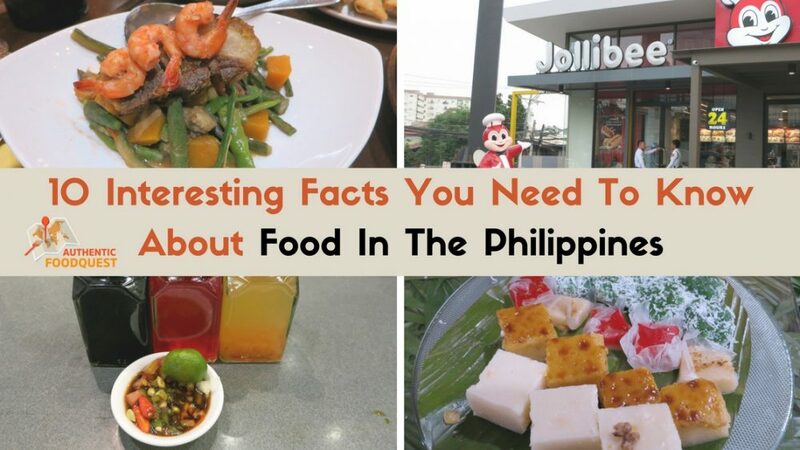 After traveling throughout the country and indulging in the local cuisine, here are 10 interesting facts you need to know about the food in the Philippines. The two distinct taste profiles that we immediately noticed in the food in the Philippines, are sugary sweet and vinegary sour. One of the popular Filipino dishes we tried was a soup called “Sinigang”. We tried various versions (chicken, pork, seafood) and in different regions of the country. The most distinctive characteristic of this soup is its sour taste. 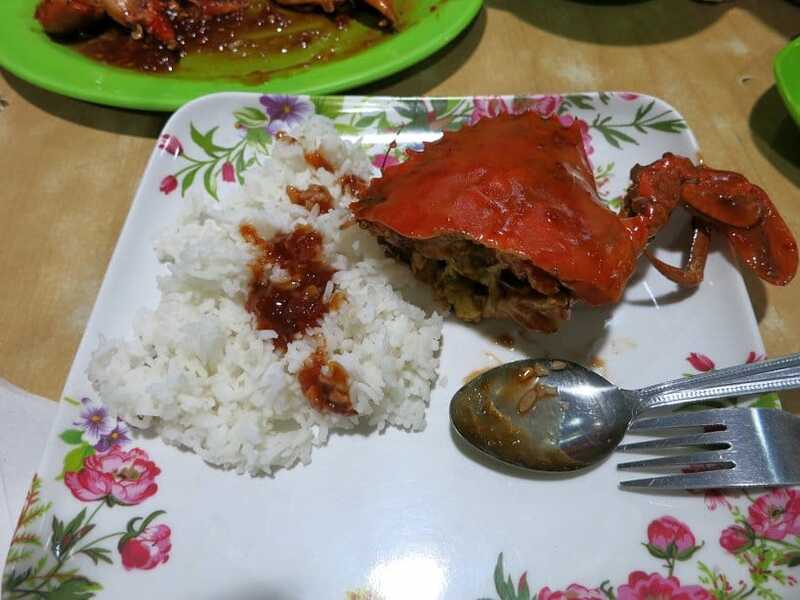 A second surprise came when eating chicken and crab cooked in the traditional Filipino style. Both were shockingly sweet and the crab came with a heavy sweet red sauce. Don’t expect the use of pepper and a variety of spices in traditional Filipino food. 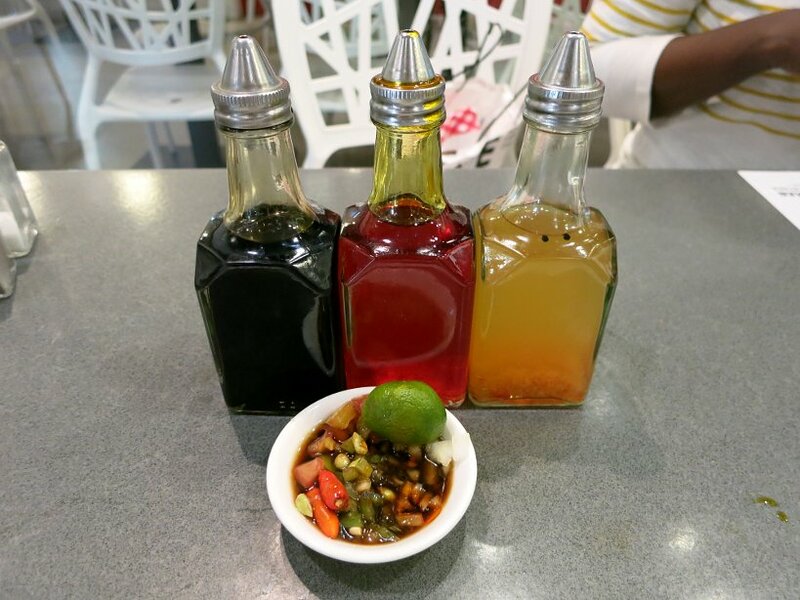 Instead, use the bottles of vinegar, soy sauce, sweet chili sauce, and calamansi (also spelled Kalamansi), a citrus fruit found at each table to make your own spicy sauce. Typical sauces with calamansi for flavoring the food. The Philippines is a meat loving country and pork seems to dominate. At any party, event or fiesta, “lechon” will be the star. Beyond the whole-roasted suckling pig, you will find pork in many of the local and everyday dishes. From fried pork (chicharones), pork stew, pork blood stew (dinuguan), to pork pieces on a stick, you will find all variations of pork. If you are a pork lover, you will love the food in the Philippines. When it is time to eat, you will find just a spoon and fork next to your plate. Filipino’s don’t use knives to eat. Instead, they push the food using the fork onto the spoon and “shovel” it into their mouths. Most of the dishes don’t require the use of a knife and the meat is often chopped up. You rarely find beef on the menu, and when you do it is sliced up. Nonetheless, sometimes you will want to use a knife with your dish. It might be to eat a whole fish or cut up large pieces of pork. That’s when the fork comes handy and it also functions as a knife. These may not be the typical tools you are used to, but they work! In the Philippines, you realize quickly that a knife is not always necessary. Be it at a restaurant or a local eatery, dishes are presented a la carte or in pots in front of you to choose from. Rarely will you see the food separated by appetizers or starters and main meals. On our quest, we noticed Filipinos tend to eat their food in one course. When you order, your dishes are brought out at the same time or as soon as they are ready. The soups come at the same time as the main dishes and everything is laid out on the table. Don’t expect to take your time eating in between courses. Everything is brought out at once and you had better eat fast while everything is still hot. One great thing about this approach, is that everybody shares together. 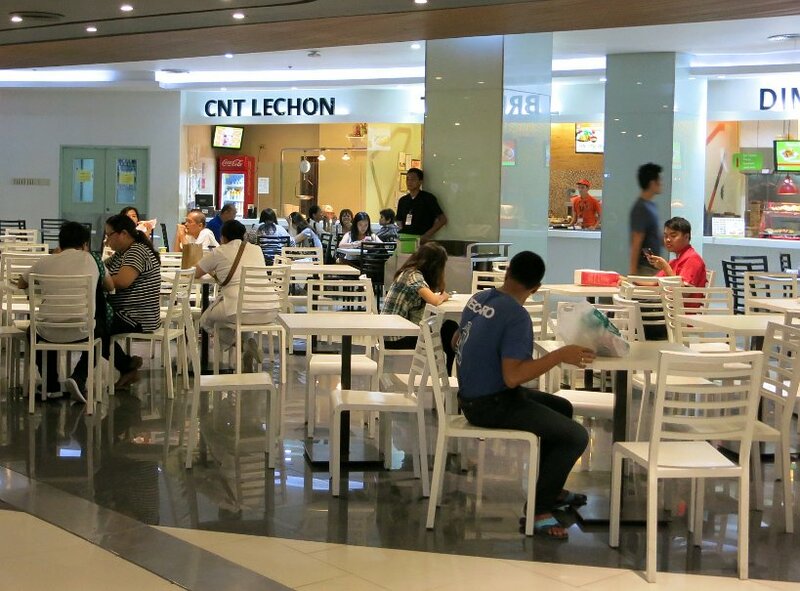 Malls in the Philippines do not only provide retail therapy, they are also centers for socializing, entertainment and dining. When we first arrived in the Philippines and wanted to try local Filipino food, everybody kept sending us to the malls. Not used to going to the malls to try local and authentic foods, we were very perplexed. Only after talking to locals and observing the local culture, did we realize that malls provide safe, air conditioned environments. Imagine our surprise when we saw a Catholic Mass taking place at the high-end Greenbelt Mall in Manila. Not surprisingly food courts and restaurants at malls, are foodie destination havens. You will find a range of restaurant options. From casual restaurants all the way to high-end restaurants, the mall can be your destination for food in the Philippines. 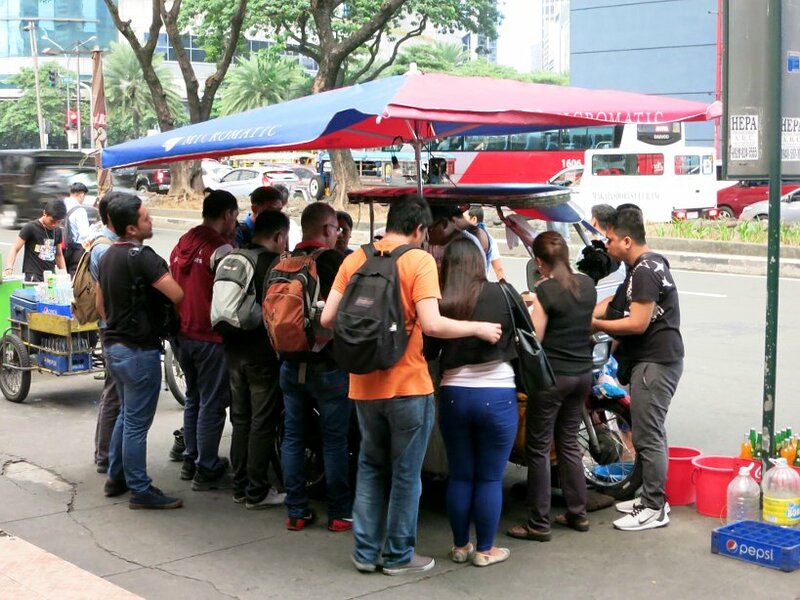 Filipinos love Merienda or “snacks in between meals”. The perfect excuse to eat several times during the day. In the Philippines, there are typically two meriendas. One in the late morning, and the other one in the afternoon. A large variety of sweet or savory dishes can be eaten at Merienda. 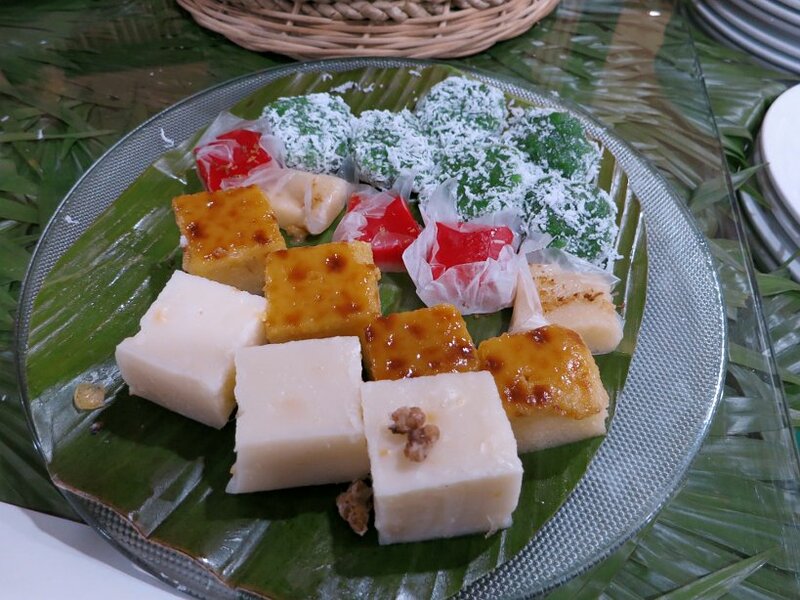 Sweet delicacies might be pastries, mango pies, sticky rice, rice cake and more. And for the savory options you might have empanaditas (small savory pastries), noodles, fish balls, and the famous local delicacy balut (developing duck embryo). With so many opportunities to eat, you will not go hungry in the Philippines! So far, as we have observed, Filipinos don’t have a culture of sitting and lingering over meals for a long time. This is very different from what we observed on our quest in Argentina, where long lunches or dinners were a favorite, especially on the weekends. As we mentioned previously, Filipinos eat all their dishes at the same time. With no set courses, it feels like people are racing through their meals. Very often, we found ourselves eating slower than most of the people at the table. In addition, lunch or dinner rarely lasted more than one hour. When in the Philippines, be prepared to pick up the pace at mealtimes. When the dish arrived, the waiter announced “here is your vegetable dish.” We were so surprised to see pork and shrimp sitting on top of a bed of vegetables. We ate pinakbet several times in different regions, and each time this tasty vegetable dish was accompanied with pork and shrimp. Purely vegetable dishes are hard to come by in the Philippines. While eating food in the Philippines, look carefully at the ingredients in the “vegetables” section of any menu. As we made our way through the country discovering the food in the Philippines, one thing that struck us was the complexity of the Filipino cuisine. The food has been shaped by Chinese, Malaysian, Spanish, Indian and Western influences. In addition, each region and island has adopted their own unique cooking style. 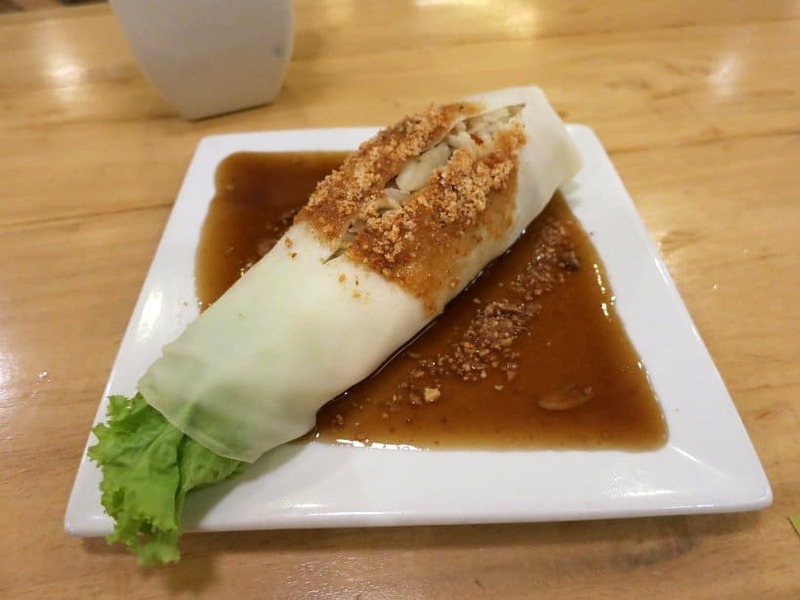 Popular dishes like pancit (noodles) and lumpia (spring rolls) have Chinese heritage. The presence of the Spaniards brought with them lechon and flan dessert. And Indian soldiers who settled in the Philippines during the British invasion, are said to have introduced kare-kare (traditional oxtail stew). These cultural influences and the diverse cooking preparation methods from the 7,000+ islands makes the food from the Philippines surprising and complex. You can’t help but notice the jovial Jollibee mascot at literally every corner of the streets. This fast food chain originally from the Philippines is predominant and loved by Filipinos. 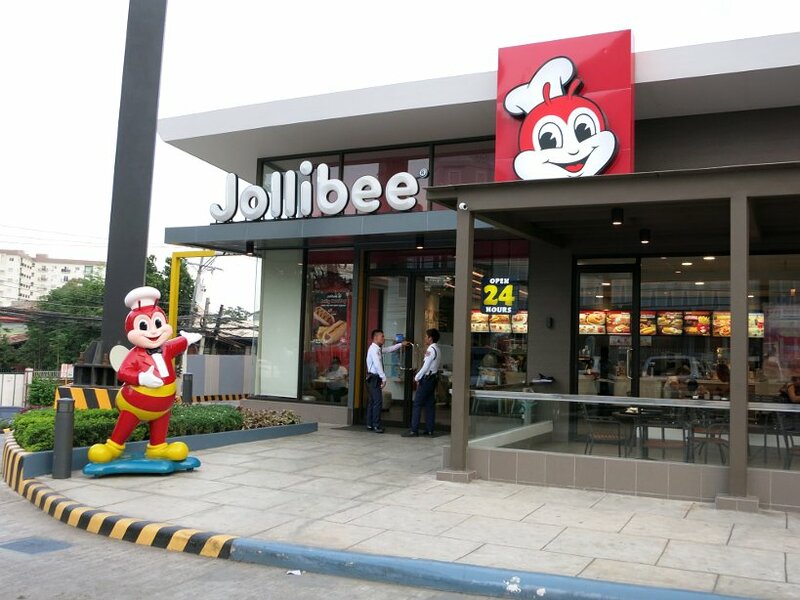 With over 900 stores in the Philippines, Jollibee dominates the local fast food market. To the point that the giant McDonald’s cannot compete in the Filipino market. The popular staples from Jollibee are Chicken Joy (fried chicken) and a sweet-style Jollibee spaghetti. And for dessert, you can’t miss the peach mango pie. 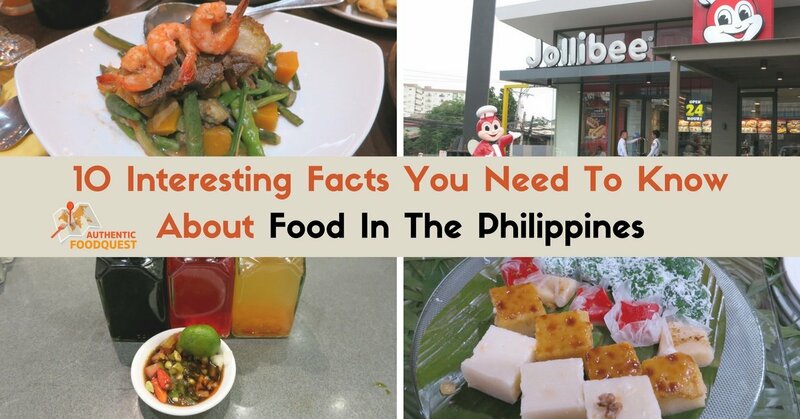 On your travels to the Philippines, get a feel for the sweet and salty taste at Jollibee! This is our first time to the Philippines and we didn’t have much expectations about Filipino cuisine prior to the trip. We have found the food from the Philippines to be full of contrasts. We have enjoyed some delicious dishes and at other times, the sweet taste especially in savory dishes has turned us off. Lacking in consistency, we found the quality of the food to be very dependent on the cook or chef. Our biggest surprise has been in discovering the different cultures and their influences in the food from the Philippines. These influences are historically based on the trade routes and colonial masters. Today, we find Filipino cuisine continuing to evolve based on Western and American influences. Stay tuned for more articles about the traditional and heritage dishes we discovered. Have you had food in the Philippines before? In the comments below, share with us what has surprised you the most about Filipino cuisine! Wow… A lot of information! Thanks for sharing. You may never know when you need it. Thank you Noel for your feedback. We appreciate it. Agreed, vegetarians can find things to eat, but it is not that readily available. Cheers! Really cool. I’d love to visit. My hubby has been several times. As a Filipino, I can say that you nailed this! Every single thing you wrote here is accurate. I didn’t even notice about how fast we eat our meals until I read it here. The Greek Mister isn’t very fond of Filipino cuisine, he doesn’t like the sweet and sour taste of our dishes. Except for sinigang, he likes sinigang. Lastly, I never realized how vegetarian-unfriendly we are but you’re absolutely right. Even the vegetable dishes will have meat in it. That’s wonderful to hear that Noemi! Glad our observations were accurate. That’s funny you didn’t notice the speed at which you eat. Sometimes it takes an outside perspective to put the ‘spotlight’ on what locals take for granted. You are right, meat dominates and that is really interesting. Thanks for your comments and feedback. I like the no course meal, serving all at once which is more family style here in the US. Thank you for such an excellent overview. One of the things my husband and I always do before visiting a new country is try to see what the food will be like. Here in the United States we don’t have many restaurants that serve food from the Philippines so it would have been a guessing game for us. My husband would love many of the pork entrees that you wrote about whereas I would have a harder time since I don’t eat pork! The duck embryo egg sounds truly terrifying to try but I’m sure being a delicacy of their culture it’s a must do for many! This was a fantastic article. I loved how organized your thoughts were and how clearly you expressed them. You hit the topic prompt – authentic fliipino food – out of the ball park. I now know that the mall is the place to go. You had so many tasty looking foods! I have always really liked that sweet and sour flavor combination. The vinegar in the dishes adds a burst of flavor that is just great. I love to see all that lechon too! It reminds me of having it in Spain where it was just so fantastic. Glad to see you had so much fun trying the foods there! Thanks so much Laura. Yes we are having a blast exploring the authentic dishes of the Philippines. So much to eat..especially the lechon 🙂 Cheers. What a great post and interesting read! I didn’t really know much about food in the Philippines. It’s sad to hear there aren’t many options for vegetarians. 🙁 But, it’s interesting to learn how the historical influences of trade and colonization have influenced the cuisine over time. It makes me wonder about cuisine in general, and how it will continue to evolve hundreds of years into the future. Great point Jackie and one that we have been contemplating as well. The future and evolution of food. What we are finding so far is a return to local produce and endemic products. The historical influences are quite powerful and evident in the food, and as a result the same dish, like lechon hails from Spain, but has a uniquely Filipino preparation style. Fascinating!! Glad you enjoyed the post. Cheers! We have a large Filipino community here in Virginia and I have the opportunity to eat a bit of Filipino cuisine(love pancit!. We even have a Jollibee here! You are kidding, there is a Jollibee in Virginia? Have you been? Agree, we love pancit and enjoyed several versions and preparation styles. Cheers! Great post! Very interesting about not using knives I didn’t know that. I loved all of the great insight you wrote about versus just writing about the food you ate! Great feedback Bryanna. Thank you so much. Before writing about the foods, we wanted to paint a picture of the food culture first. More to come shortly 🙂 Cheers. I haven’t been to the Philippines before and the only Philippines food I’ve tried before was in Dubai. It’d be quite hard for me to find something to eat – I guess it would need some effort and time to find suitable meals for me (and vegetarians in general) because, as you said, most of their food is meat-based, esp. pork, which I don’t eat. I love food from the Philippines especially some of the more bold flavors. Luckily they have an authentic Philippines fusion place here in Phoenix where i can find some great food. I can’t wait to visit the Philippines one day though. That’s wonderful Pamela, that you have great Filipino food in your hometown. I do hope you get to the Philippines soon and try it there. Do you have a favorite dish? Thanks for stopping by. I like the fact that the malls are the place to eat – sounds reasonably cheap. Glad to know they like pork in the Philippines just as much as I do! Indeed, Filipino cuisine is relatively inexpensive compared to the U.S. If you love pork, you will be right at home in the Philippines. 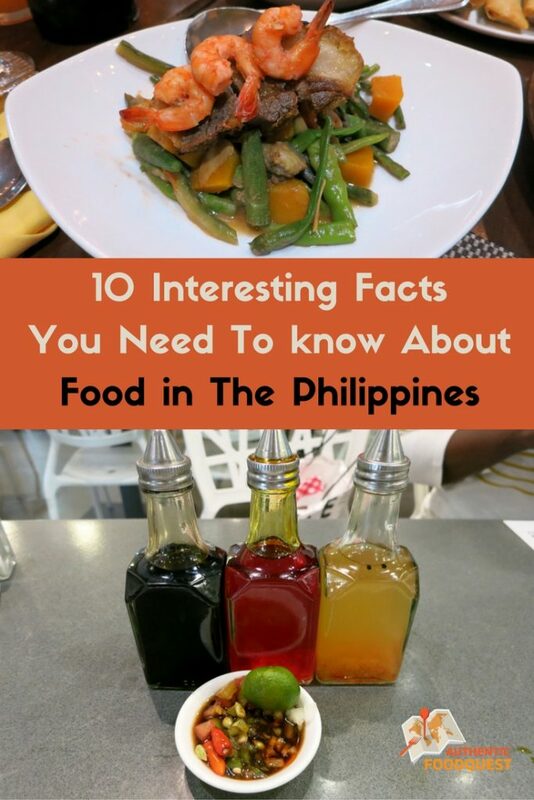 Hope you can visit and eat the local food in the Philippines one day. Thanks for your comments. That’s great to hear Meg. We also enjoyed our time very much in the Philippines as well. Yes, it’s true the different cultural influences are quite amazing and diverse in the cuisine. Quite tasty!! Thanks for stopping by! What a great experience. I am not sure about getting all my food at once, or not lingering over a meal with friends. It is indeed a different food culture. As they say, “when in Rome…”. You get used to it 🙂 Thanks, Tandy! I’ve never been to the Phillipines, but I do love to snack between meals. I’d miss using a knife, though. It’s funny Tiffany, but after a few meals, we didn’t miss a knife. The food is typically cut up for you making it much easier to handle. The snacks are so diverse, you would really enjoy choosing between the sweet and savory options. Cheers! Hi Claire, Rosemary …great post! I was laughing to myself when I read your observations about food in Philippines because I was remembering some of the funny moments when we were presented with all kinds of dishes in Ilocos 😂 Never before have I eaten so much pork (and in large portions too) when I travel but I must say, the Filipinos cook ’em well! Hi Kat, thanks for your comments. It’s true the food in Illocos was quite diverse and indeed “pork” was the main feature. Yes, you are right, the Filipinos do know how to prepare the pork in all variations. A great time and amazing food! Thanks again. Cheers! We have travel here on our list, so thanks for great information. In Chiang Mai we were also encouraged to eat at the mall food courts and got some great and affordable food in a clean and air conditioned space! That’s interesting Laurie that eating in the malls also takes place in Thailand 🙂 Glad you found the information helpful. Please let us know if you have any questions as you prepare for your visit to the Philippines. Cheers. My sister in law is Filipino and has a large Filipino family in Australia. I have to say the foods at their family gatherings haven’t inspired me greatly as I find it heavy on purchased products like sauces, sausages and a lot of things made with condensed milk. They are wonderful friendly people though! Wow thank you for sharing so much about food in the Philippines! It’s amazing finding out about the different sauces you’re likely to find on a table like different or that lingering over your food is not the norm. So glad you enjoyed reading about the food from the Philippines. It’s always interesting to observe the cultural differences when traveling. Yes, we were surprised by how harried the meals are, and of course the different sauces. A tryly unique experience 🙂 Thanks for your comments. These pictures are amazing! I am dying to visit the Philippines! Thank you Adriana. So glad you like the pictures. The Philippines is amazing and worth visiting. Hope you can get there soon 🙂 Cheers! I love this, learning about food cultures in different countries is one of my favorite things when I travel. Filipino food doesn’t get the best connotation when you’re comparing it to other cuisines in Southeast Asia so I’m glad to learn a bit more about it. I’m hoping to head to the Philippines later this year. I heard TBEX Manila was awesome, glad you had a chance to go! Was it your first TBEX or have you been to a few already? Yes Mimi, it was our first TBEX and our first time in the Philippines. It is truly a beautiful country and you will enjoy discovering it. Do you know where you are going? How long will you stay? Glad you loved reading our observations about the food in the Philippines. Please let us know if you need any tips. Cheers! One of my work colleagues has recently returned from business trip to Manila. She said the food was OK but had to forget her diet – Filipinos just love meat and sea food. Great question Joanna about vegetarians and vegans in the Philippines. The good news is that there are vegetarian and vegan options available, the bad news is that they are not easy to come by. With a little research and making specific requests from the cooks, one can find what they are looking for 🙂 Cheers! Wish you could have tried Ilonggo and Negrense cuisine because it’s different from what you get anywhere, particularly La Paz Batchoy, pancit molo, kadyos baboy langka in Iloilo, and authentic chicken inasal, kansi in Bacolod (Negros Occidental hence the negrense adjective) and the variety of seafood especially molluscs. These two cities are like twin sisters, very similar cuisines but with some slight differences. Savory foods that are supposed to be savory are generally savory, desserts are sweet (both cities used to be home to highly lucrative sugar plantations). The only exception: the batchoy in Bacolod is sweet, unlike the original one in Iloilo, and the chicken inasal in Iloilo is sweet compared to the original coconut vinegar marinated version that originated in Bacolod. 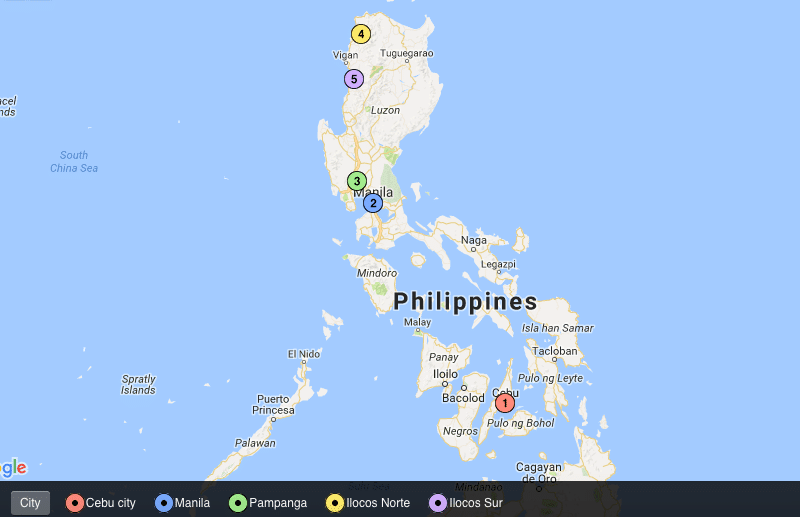 I noticed that provinces with vast sugar plantations (home of former sugar barons) have some of the best or most elaborate cuisines in the country. It could be the vast amount of wealth and trading encouraged the growth of lots of eateries and preference for good quality food. Both towns also have a lot of Chinese population and this might be one of the reasons for why many foodies come from here. That said, Bacolod has better quality Western style food than Iloilo, probably due to the number of rich locals who studied in expensive schools in Manila or abroad. Another cuisine that will challenge your conception is Bicolano cuisine which uses lots of coconut milk and chilis. Wow, thanks so much Kay for adding your perspective on the foods of the Philippines. We did get a chance to eat authentic chicken inasal and loads of seafood that we will be writing about. We wish we had more time in the Philippines, we’d absolutely love to explore the food from lloilo and Bicolano…it all sounds absolutely delicious! Thanks so much for sharing this delicious information!! Filipino cuisine is one of the least exciting in the world. Compared to Thai, Vietnamese, French, Italian, etc.. cuisines it is just totally boring and dull. That’s interesting Alex. It’s true there are some aspects of Filipino cuisine we did not enjoy such as the sugary aspects of the food or the fast food chains. 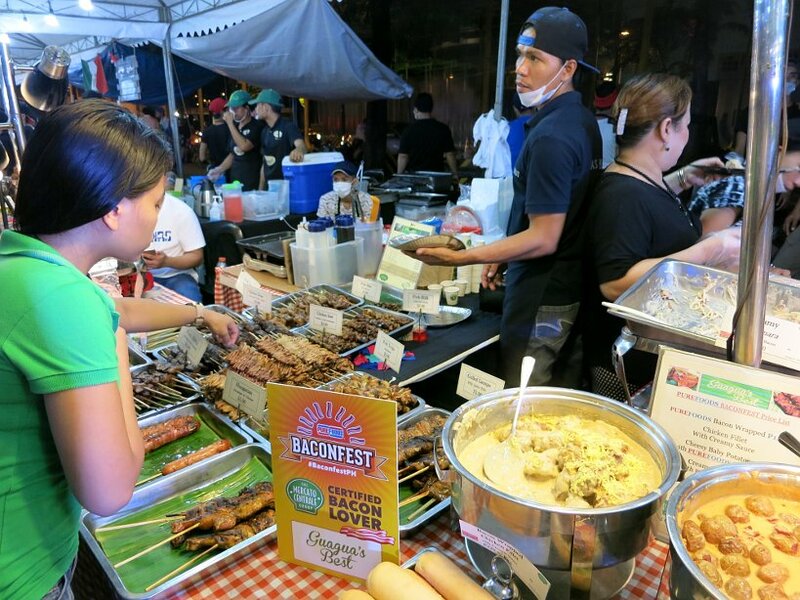 However, did you try some of the local specialties like “lechon” or “Sisig”? Did you try desserts like Halo Halo? The idea is to get off the tourist path and explore the local delights. 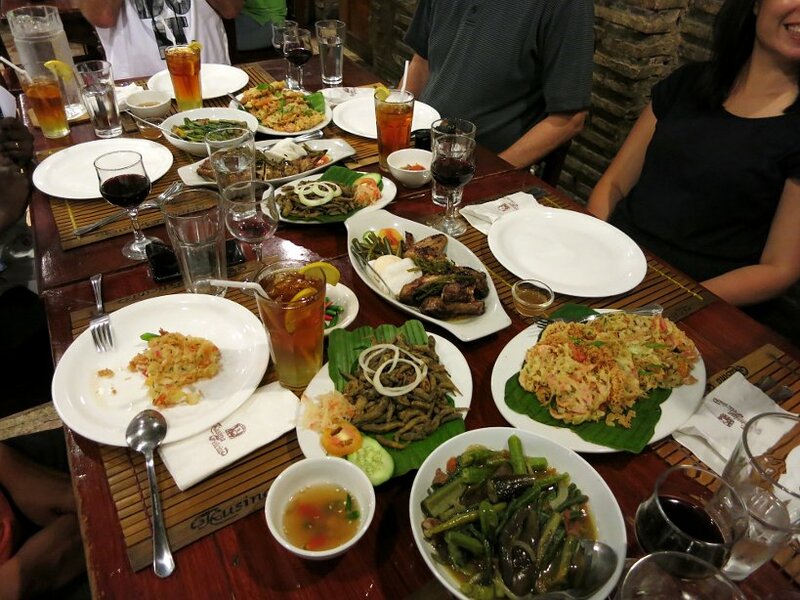 Our articles about the best dishes from a local’s perspective – The Most Popular Filipino Dishes You Want to Try with Anton Diaz is a great place to start. Thanks for reaching out Alex!